Let’s Make a Ninja Film! Get ready to meet the world’s smallest and most resourceful mercenary for hire! As I’m in position right now where I can pursue some of my passion projects. 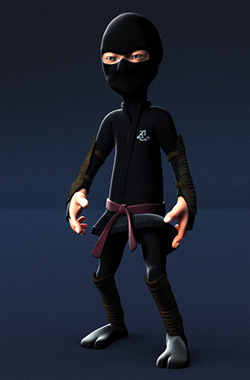 I have a project that I’ve been wanting to do for a long time, a short film about a Ninja character which I created way back. I’m now officially changing the status from “on hold” to being “in production”. If you’re interested to follow the process of this animated short film, please like the Facebook page, where regular updates will be posted. Other ways to keep track on this production is via Twitter, RSS or the website. The Facebook page will be the primary channel for updates at this time. First we blow it up! This film production will be a two step procedure. First there will be a proof of concept process. Which is a shortened down version, one scene only. The proof of concept isn’t about storytelling or setting the film’s world in stone, but to iron out and construct an efficient pipeline and workflow. It will be a complete filmmaking process from storyboarding to post production, just compressed and then trashed! I want to define a workflow early on that’s solid, reusable, operates within a shoestring budget, delivers a high technical quality and look for this production and others to come. Can I tempt with making a film? Film is a unique form of art in the way that it’s a team effort. Behind a film there are people from different artistic disciplines collaborating towards the final goal. Artists working together to make the film the piece of artwork it can become. I’m not fooling myself in believing that I can wear all hats to make a great film by myself, nor do I want to, so I’m going to want to collaborate with others when the proof of concept is finished. More to come on how this will be organized at that time, but I’ve developed my Shinobi system amongst other things for this very purpose. It’s a bit too soon right now until I’ve figured everything out, but if interested to join me later on, let me know. Anyway, if wanting to keep up with the production process for any reason whatsoever, please like the Facebook page.